As a key supporter for The Vortex which made its world debut in Singapore, World of Diamonds Group presented an art-for-charity gala evening which benefitted the International Committee of the Red Cross. A-lister Jane Seymour, OBE, adopted a leading role in the British Theatre Playhouse’s production – a play about sexual vanity and emotional dependency and set in the world of 1920s London high society. 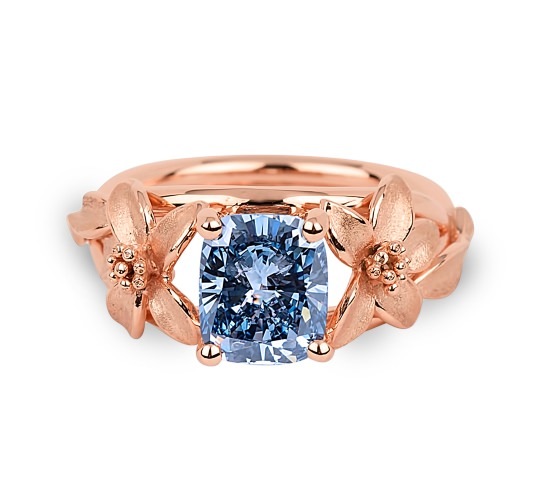 To celebrate Seymour’s accomplishments in the film industry, World of Diamonds Group crafted a 2.08 carat Fancy Vivid Blue diamond ring in platinum, and plated with rose gold. The masterpiece, named The Jane Seymour, was created for the diamond behemoth’s private collection. Based on recent records from auction powerhouses, Sotheby’s lists a 2.11 carat fancy intense blue diamond ring that fetched USD 1,899,322 in October 2015, and according to Christie’s, a 1.74 carat fancy intense blue diamond ring fetched USD 1,925,000 in December 2015. The industry recognizes fancy vivid blue diamonds as being rarer and therefore more valuable than their fancy intense counterparts. The Jane Seymour could easily fetch in excess of USD 2,000,000, however, the creation is priceless after accounting for its celebrity recognition. The Jane Seymour has already attracted much interest globally, with even offers from royal families. However, the World Of Diamonds Group will only pass the ring to a true connoisseur through an undisclosed selection criteria, and who will be the eventual owner of this ring is what the world is waiting for. It won’t be surprising even if the ring fetches over USD 5,000,000. It is after all, the first and only jewelry creation in the world named after Jane Seymour herself, who serves as an ambassador to the masterpiece. Could this be the most expensive diamond ring sold, in price per carat?